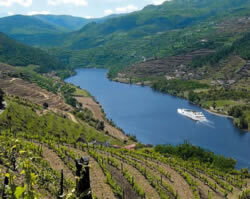 Travel from Portugal into Spain on the Magnificent Douro River. A relaxing, unhurried journey into the heart of beautiful and un crowded northern Portugal. A gentle and relaxing journey through Portugal's Douro River Valley, famous for its steep terraced vineyards of Port wine grapes. You will visit charming villages, sample the tasty cuisine onboard your ship and at local restaurants and enjoy local Portuguese and Spanish entertainment. The cruise begins and ends in the city of Porto, first settled over 5,000 years ago. Your ship is moored at the Vila Nova de Gaia Quay, across the Douro River from Porto. The dock is in front of the Caves Ramos Pinto (Ramos Pinto Port wine cellars). Boarding begins at 18:00 (6pm). Dinner is included this evening. Overnight on board. Sail from Porto this morning to Caldas de Aregos, a delightful spa town famed for its waters. Continue to Regua where your ship will moor for the night. Regua is the center of this port wine producing area. Depart the ship at 19:00 (7pm) for a city tour and visit a country estate (Quinta) for dinner featuring northern Portuguese specialties. Depart the ship at 08:30 this morning for a tour of the city of Vila Real and Mateus Palace Gardens & Casa de Mateus, an outstanding example of Baroque architecture whose picture is used as the label for Mateus rose wine. The Casa has enchanting and romantic gardens including a 100-foot long cedar tunnel. Continue to Barca D’Alva for the night. A short sail this morning from Portugal into Spain. Dock in Vega de Torreon, then travel by motor coach at 08:30 to Salamanca for a full day excursion. Enjoy a typical Spanish lunch after the tour. You will have free time this afternoon to stroll this charming old Spanish town. This evening, you will be treated to an exciting Flamenco show on board. Relax this morning as your ship glides through the peaceful waters of the Douro. After lunch, you will dock in Feradossa and enjoy a scenic drive through the vineyards to Sao Salvador do Mundo and Sao Joao da Pesqueira for a visit to a Port wine quinta (country estate). Reboard your ship in Pinhao. Sail back to Regua this morning. At 09:30 you will depart for a tour of Lamego, set amidst terraced vineyards and fruit orchards. Eighteenth century homes line the streets. You will also find a 12th century cathedral and the pilgrimage church of Nossa Senhora do Remedios which affords outstanding views of the city and surrounding valley and sits atop an seemingly endless staircase. This evening there is a guided tour of the Alpendurada Monastery followed by a fabulous dinner. Enjoy a relaxing morning on the river before arriving back in Porto. Depart your ship at 10:30 for a guided tour of Porto and one of the port wine cellars located in Vila Nova de Gaia. Porto is an ancient city, dating back over 5,000 years. The wealth of Portugal’s colonies poured into the city and many of its churches and other buildings are decorated in exotic Brazilian woods and gold. Free time this evening to enjoy the city. Overnight on board. Porto. Disembark after breakfast at about 9:30am. The company reserves the right to modify the itinerary due to weather, water levels and reasons beyond their control.